The Vertol VZ-2 (Model 76) was used to investigate vertical take-off and landing. In this historical photo from the U.S. space agency, arriving at Langley from Edwards Air Force Base, Califorina in 1960, this Vertol VZ-2 (Model 76) underwent almost a year and a half of flight research before going back to the manufacturer for rework. 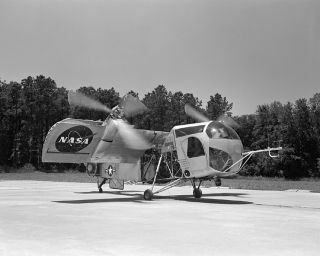 The VZ-2 was used to investigate Vertical Take-Off and Landing (VTOL).